You may copy them for your personal use, but please respect my copyright and do not republish them in any form, including copying them to your tree on Ancestry or elsewhere, unless you have obtained written permission from me. For details about all these partnerships, please see The Cobb Brothers in Business. The stores operated by the Cobbs and their partners extended credit to their customers, in some cases taking mortgages to secure those accounts. Many of the mortgages list all the borrowers' crops, livestock, tools and household goods, and thus provide an interesting insight on the lifestyle of those farmers. See Accepting Mortgages for some examples. Among the Cobb brothers' extensive real estate transactions were a number that involved members of their extended family, some apparently adversarial in nature. For details about all these family transactions, please see The Cobb Brothers' Transactions with Family. [S2303] Kilbury-Cobb, "RE: Cobb Ancestry," e-mail to author, 15 Jun 2001, citing hand-written pages titled "From Joshua Cobb's Family Bible," provided by Lillian W. Sprout, 5 Dec 1931, Montrose, Pennsylvania, shows name as Robert L. Cobb. [S732] Caldwell Co. Marriage Records, loose papers, bond of Robert L. Cobb and Fransis Hey Dallam, 12 May 1835, signed by him as Robt. L. Cobb; and License, dated same day, shows name as Robert L. Cobb. [S49] Freeman, Family File "David and Deborah.GED," 31 Jul 1998, shows full name. [S2303] Kilbury-Cobb, "RE: Cobb Ancestry," e-mail to author, 15 Jun 2001, citing hand-written pages titled "From Joshua Cobb's Family Bible," provided by Lillian W. Sprout, 5 Dec 1931, Montrose, Pennsylvania. [S1042] Connelley and Coulter, History of Kentucky, pg 497. [S2303] Kilbury-Cobb, "RE: Cobb Ancestry," e-mail to author, 15 Jun 2001, citing hand-written pages titled "From Joshua Cobb's Family Bible," provided by Lillian W. Sprout, granddaughter of Joshua Cobb, with notarized statement 5 Dec 1931, Montrose, Pennsylvania, that they were from a Bible in her possession, shows date. [S1820] Robert L. Cobb household, 1850 U.S. Census, Caldwell Co., Kentucky, shows age 45, county, and state. [S1811] Robert L. Cobb household, 1860 U.S. Census, Lyon Co., Kentucky, shows age 56, and state. [S732] Caldwell Co. Marriage Records, loose papers, bond of Robert L. Cobb and Francis Hey Dallam, 12 May 1835, shows intended to be married shortly, and License, dated same day, has return showing marriage solemnized 13 May 1835. [S726] Caldwell Co. Marriage Bonds, Book A, Robert G. Cobb to Miss Cornelia Mims, 13 May 1835, shows date. [S49] Freeman, Family File "David and Deborah.GED," 31 Jul 1998, shows date, town, county, and state. [S1820] Robert L. Cobb household, 1850 U.S. Census, Caldwell Co., Kentucky, shows both in household. [S7347] "Mr. Robert L. Cobb," Clarksville Chronicle, 21 Jun 1873, shows "a few days ago" and city. [S3235] Obituary for Mrs. Cornelia B. Cobb, unknown newspaper, 2 Jun 1875, shows he had died nearly two years before she did, 31 May 1875. [S1042] Connelley and Coulter, History of Kentucky, pg 497, shows year, as 1875, city, and state, and that his wife survived him only a few months and died in 1877. [S583] Cobb & Clarke household, 1810 U.S. Census, Caldwell Co., Kentucky. [S826] Lyon letter to Witherell, 5 Apr 1828, shows that Samuel C. Clark was living with G. D. Cobb in 1828. [S576] Gideon D. Cobb household, 1820 U.S. Census, Caldwell Co., Kentucky. [S1789] Gideon Cobb household, 1830 U.S. Census, Caldwell Co., Kentucky. [S1975] Deeds, Caldwell Co., Kentucky, G:160, Noel Watkins & wife Sarah M. to Robert L. Cobb dated 16 Oct 1832, $70 for lot #7 in Eddyville; G:284-5, Berry Hodge of Union Co. to Robert L. Cobb dated 17 Dec 1833, $1 for lot #7 in Eddyville, clearing title of lot Cobb bought from Watkins because no conveyance from Hodge to Watkins was recorded; and M:47, Robert L. Cobb & wife Cornelia B. to Thomas W. Catlett dated 26 Jan 1844, $3500 for lot #7 in Eddyville. 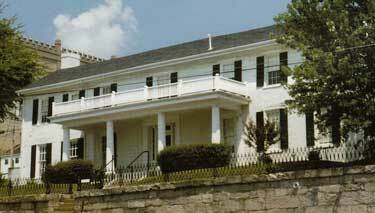 [S2001] Walker, "Rose Hill -- The Cobb House," pp 38-9, shows that Cobb built the house about 1832, sold it to Catlett in 1844, who owned it until 1897, when it became the property of his granddaughter Belle Minner Hussey, bought by the state in 1952 and used for housing until given to the Historical Society. [S1977] Cobb, Exit Laughing, pg 26, shows name and origin, "the finest in town." [S1975] Deeds, Caldwell Co., Kentucky, O:176-7, Edmund P Watkins, Commissioner of Chancery to Robert L. Cobb, 30 Apr 1849. [S3175] Acts of the General Assembly of Kentucky, 1883, 1858:2:206. [S3152] Deeds, Lyon Co., Kentucky, B:554-5, James Lester, J. C. Holloway, O. M. Jenkins, Charles Wood & Thos. P. Paine, trustees of town of Eddyville to Robert L Cobb, 6 May 1865, sale of streets. [S3152] Deeds, Lyon Co., Kentucky, H:258-9, W. M. Bowman & wife Mattie A. to Commonwealth of Kentucky, conveyed the six town lots, surrounding streets, and adjacent 74½ ac, 9 Sep 1884. [S3400] Cunningham, Castle, pp 23-4, describes sale at court house door and Machen's sale to the state. [S3152] Deeds, Lyon Co., Kentucky, a search of all indexed deeds from "sheriff" and "commissioner," and to W. B. Machen in vol B, C & D (covering deeds recorded Jan 1859 through Dec 1871), and a page-by-page search of the first half of vol D, failed to find such sale; H:254-275 records deeds to "Commonwealth of Kentucky" for all town lots within the initial prison grounds, with none by W. B. Machen; C:384-5, Robert L. Cobb to William W. Young, mentions dwelling house, stables & ice house, 8 Feb 1868; D:425-8, J W Clark, commissioner, to John H. Turley & others, for $3143.25, mentions same as having been there on date of previous deed; F:258-60, J. H. Turley & others to James C. Glenn for $800, does not mention buildings, 26 Nov 1878; G:41-3, James C Glenn & wife to Rebecca E. Lefeber for $1000, reserves brick from ice house to seller, 16 Feb 1881; H:57-8, James H. Lefeber & wife Rebecca E. to W. M. Bowman for $350, make no mention of buildings; and H:258-9, W. M. Bowman & wife to Commonwealth of Kentucky for $500, reserves "all building stone where the Cobb houses were burnt" to seller. [S3426] "Home Used as Prison Hospital," Courier-Journal, 4 Aug 1969, describes building as home of "Gen. Mathew Lyon, Civil War hero; follow-up column "History of Old Prison Building Is Shaping Up," 15 Aug 1969, says it was thought to have been the home of Gen. Hylan B. Lyon and maybe his grandfather, but records did not show either ever lived in the house. [S3406] "Report of the Building Commissioners of Branch Penitentiary", pg 15, shows that the hospital will be constructed near the top of the hill; and pg 23, describes how the hospital will be a frame or brick building. [S3407] Journal of the House of Representatives of the Commonwealth of Kentucky: 1891-'92, II:2902, shows claim for cost of additional work done on hospital building beyond contract requirements; and III:3301, report of committee sent to inspect damage from fire Feb 1893, reports main building a total wreck. [S1977] Cobb, Exit Laughing, pg 26, shows death house were rose garden was. [S3402] Bill Cunningham note to author, 12 Dec 2011, included copy of photo showing death house attached to north end of cell house 3. [S3401] Sanborn Map of Eddyville, 1905, sheet 2, shows cell house 3 along Washington St., with its north end somewhat south of the southerly line of First (formerly Second) St.
[S1795] R. L. Cobb household, 1840 U.S. Census, Caldwell Co., Kentucky. [S1820] Robert L. Cobb household, 1850 U.S. Census, Caldwell Co., Kentucky. [S1745] Robert L. Cobb, owner, 1850 U.S. Census, Caldwell Co., Kentucky, slave schedule. [S1811] Robert L. Cobb household, 1860 U.S. Census, Lyon Co., Kentucky. [S1675] Robert L. Cobb, owner, 1860 U.S. Census, Lyon Co., Kentucky, slave schedule. [S1971] Caldwell Co. Order Book, E1:86. [S1971] Caldwell Co. Order Book, E1:168, exhibited his commission and took oath; E1:319, authorized to solemnize marriages and entered into a bond. [S1971] Caldwell Co. Order Book, E1:362, judge for 1835 town election; E1:378, judge for county election; E:505, judge for 1837 town election; and E1:528 election results. [S1971] Caldwell Co. Order Book, E1:508, appointed commissioner for sale of land; E1:526, appointed treasurer. [S3152] Deeds, Lyon Co., Kentucky, A:305-6, Robert L. Cobb & wife Cornelia B. to Fred H. Skinner, presiding Judge of the Lyon Co. Court dated 1 May 1856, in consideration of the Court House being located on the lot, south half of lot #8 in Eddyville and jail house and land on which it stood, _ May 1856. [S3152] Deeds, Lyon Co., Kentucky, D:113-4, R. L. Cobb to R. C. Wilcox, W. B. Timmons & James Stephens, trustees for use and benefit of the Methodist Episcopal Church South, in pursuance of agreement made prior to building of the Church Ediface, 10 Jan 1870. [S2965] United States Congressional Serial Set, Senate Doc. No. 234, 58th Congress, 2nd session, Journal of the Congress of the Confederate States of America, 1861-1865, vol 1, 7 Dec 1861, pp 536-41, contains text of ordinance listing the delegates and letter from the Provisional Governor with details of convention. [S1977] Cobb, Exit Laughing, pg 25, citing ledger and day books of the business, shows Robert taken into the business at age 21. [S1975] Deeds, Caldwell Co., Kentucky, F:60-1, John W. Marshall & Samuel P. L. Marshall to Chittenden Lyon, Caleb C. Cobb & Robert L. Cobb dated 2 Oct 1829, $150 for 45x60 ft. lot below Water St., near Main St.; F:424-5, Minerva Catlett executrix for Hanson Catlett to same dated 24 Jul 1830, $80 for40x60 ft. lot below Water St. at Main St.;F:288, John Bradley of Princeton to same dated 10 Jan 1834, $214.38 for lot at Main and Water Sts. where Lyon, Cobb & Co. had a 40x60 ft. ware house (this appears to be the same lot, with the odd amount suggesting the settlement of a debt although the text does not say it is); H:236-7, Robert L. Cobb to William Gray dated 2 Aug 1836, $1500 for 1/3 share of 85x70 ft. lot at Water and Main Sts. with a two-story brick house, 80 X 40 ft., erected by Lyon, Cobb & Co., property held the last day of Jun 1836 by C. Lyon, C. C. Cobb and R. L. Cobb as joint tenants; H:237-8, Chittenden Lyon to Robert L. Cobb dated 31 Aug 1836, $1500 for 1/3 share in same property; and K:148, Caleb C. Cobb to same dated 10 Jun 1841, $1500 for 1/3 share in same property. [S875] Wills, Caldwell Co., Kentucky, B:57-9, Chittenden Lyon Will, 21 Nov 1842, shows Caleb to settle affairs of Lyon & Cobb, and Robert to settle those of Lyon, Cobb, & Co.
[S1975] Deeds, Caldwell Co., Kentucky, H:236-7, Robert L. Cobb to William Gray dated 2 Aug 18, $1500 for 1/3 interest in lot on Water and Main Sts. purchased by Chittenden Lyon, Caleb C. Cobb & Robert L. Cobb where they erected a two-story brick house occupied by Cobb, Gray & Bell as a store and ware house; and I:72-3, John F. Veid mortgage to Robert L .Cobb, William Gray, David R. Bell & Gideon D. Cobb “merchants & copartners trading under the name and style of Cobb, Gray & Bell” dated 23 Jun 1838. [S1975] Deeds, Caldwell Co., Kentucky, K:249-52, C. C. Cobb to Robt. L. Cobb, David R. Bell & Gideon D. Cobb "trading under the style & firm of Cobb Bell & Co.," 16 Sep 1841. [S1795] R. L. Cobb household, 1840 U.S. Census, Caldwell Co., Kentucky, shows the only person employed, apparently Robert, as employed in commerce. [S1820] Robert L. Cobb household, 1850 U.S. Census, Caldwell Co., Kentucky, shows Robert's occupation as merchant. [S1811] Robert L. Cobb household, 1860 U.S. Census, Lyon Co., Kentucky, shows Robert's occupation as merchant. [S578] Gideon D. Cobb household, 1850 U.S. Census, Crittenden Co., Kentucky, shows Gideon and Caleb living with a group of young men whose occupation appears to be laborer, apparently in the iron works, with Caleb's occupation as iron maker and Gideon's as merchant and iron maker. [S1975] Deeds, Caldwell Co., Kentucky, M:127-8, Edward T. Walkins, Commissioner in Chancery to Robert L. Cobb and Gideon D. Cobb of the firm of R. L. & G. D. Cobb dated 4 Feb 1845, $1500 for the interest of Elijah Shepardson in a house and lot in Princeton in settlement of debt owed Robert L .Cobb & Gideon D. Cobb, surviving partners of Cobb Bell & Co.
[S1975] Deeds, Caldwell Co., Kentucky, L:454-9, John Stacker of Missouri, Samuel Stacker of Tennessee & Thomas T. Watson of Trigg Co. to Robert L. Cobb & Gideon D. Cobb dated 20 Jul 1844, $10,000 for several parcels of land, on which Eddyville Furnace stands and adjacent thereto: 1st 100 ac. survey made for Christopher –-?–- , conveyed to John Jones and by him to grantees, where Eddyville [Furnace?] stands; 2nd 100 ac. on –?– Ck., purchased of John Hammonds; 3rd 50 ac. on Cumberland River immediately below the Furnace; 4th 30 ac. purchased of C. C. Cobb upon which the Furnace landing sits; 5th 2 surveys of 400 ac. each purchased of Randolph Doom; 6th 300 ac. bought of Henry Doven; 7th 480 ac. survey made in name of Saml. & John Stacker & Thomas T Walter on Cumberland River; 8th 260 ac. survey made in name of Samuel & John Stacker & Thos T Walter; 9th 700 ac. survey made in name of Samuel & John Stacker & Thomas T Walson; 10th 100 ac. survey in name of Stacker & Watson on Cumberland River; 11th [blank] ac. survey; 12t 300 ac. survey for Slacker & Watson on Cumberland River; 13th 124 ac. survey in name of Daniel Glenn on Goat Ck. ; 14th 400 ac. survey made for E. S. Galusha conveyed by him to Stacker & Watson; and 15th 90 ac. survey made in name of Joshua Hammond purchased of him. [S2793] Deeds, Crittenden Co., Kentucky, B:593-5, Robert L. Cobb & Cornelia his wife, and Gideon D. Cobb, merchants doing business as R L & G D Cobb, to William Kelly and John Kelly, iron masters, doing business as Kelly & Co., two parcels in Crittenden Co., 21 Oct 1850. [S3055] Travis, "A Thriving Town in the 1800s", shows Jackson & Cobb were selling goods along with shipping tobacco in 1851. [S1975] Deeds, Caldwell Co., Kentucky, G:451, John Hallick to Robert L Cobb, 13 Jan 1835, signed by Hannah though she is not named in deed or clerk's statement; and L:227, John Hallick to Robert L. Cobb, 7 Feb 1844. [S2793] Deeds, Crittenden Co., Kentucky, A:320-1, Thomas W. Catlett to Robert L. Cobb, 22 Jan 1845; A:245-6, Robert L. Cobb to Robert Smith, 2 Oct 1844. [S1975] Deeds, Caldwell Co., Kentucky, K:425-6, George M. Marshall mortgage to R. L. Cobb, D. R. Bell & G. D. Cobb of the firm of Cobb Bell & Co. dated 16 May 1842; N:246, George M. Marshall mortgage to Robert L. Cobb & Gideon D. Cobb, merchants trading under name & style of R L & G D Cobb, and surviving partners of Cobb Bell & Co., 21 Aug 1847; B:727, George M. Marshall mortgage to Giles L Cobb & Charles M Jackson of Crittenden & Gideon D Cobb of Caldwell, trading as Cobb Jackson & Co., 14 Apr 1851; D:72, George M. Marshall mortgage to Gideon D. Cobb, 27 Jun 1855; and F:247, George M. Marshall mortgage to Cobb Gallatly & Co. of Dycusburg, 21 Jun 1860. [S1975] Deeds, Caldwell Co., Kentucky, O:176-7, Edmund P. Watkins, Commissioner of Chancery to Robert L. Cobb, 30 Apr 1849. 17 May 1847: and N:185-6, same to John Hallick, recorded same day. R:158-9, same to William A Brooks,14 Jul 1852; Q:2-4, same to Gideon D. Cobb, 23 Sep 1852; Q:138-40, same to William H. Calvert, 24 Sep 1852; and Q:241-3, same to Robt. L. Cobb, 6 Apr 1853. [S1975] Deeds, Caldwell Co., Kentucky, Q:102-3, Elijah G. Galusha to R. L. & G. D. Cobb dated 8 Sep 1852; and P:87-9, Elijah G. Galusha mortgage to R. L. & G. D. Cobb, merchants of Eddyville, dated 24 Aug 1850. [S826] Lyon letter to Witherell, 5 Apr 1828, describes Galusha as "a poor farmer." [S3152] Deeds, Lyon Co., Kentucky, A:428, James Clark & wife to R. L. & G. D. Cobb, 1 May 1857; and B:556-7, Robt. L. Cobb & Gideon D. Cobb to Jacob T. Young, 24 May 1865. [S1975] Deeds, Caldwell Co., Kentucky, G:349-50, Thomas Rucker to Robert L. Cobb dated 7 May 1834, $214 for 71 ac. on Eddy Ck. ; H:246-7, Cyrus Broadwell & wife Virginia to same dated 17 May 1836, $400 for 97 ac. on both sides of road from Eddyville to Princeton; I:70-1, Samuel Campbell to same dated 1 Sep 1836, $369 for 125 ac. on Skinframe Ck. ; L:156-7, Charles Jones to same dated 20 Jul 1840, $200 for parcel on Davenport Ck. on the road from Eddyville to Marshall's ferry; L:9-10, Martin A. Rucker to same dated 27 Feb 1843, $900 for 1/5 part of real & personal estate of Robert Harris decd. and life estate of Mrs. Mary Cartwright in land of Harris, 200 ac., and her life estate in Harris' Negroes; M:276-8, Justenian Thrumond, Nepoliean B Thurmond, James L Thurmond, Philip Thurmond, Samuel B. Bennett, Rhoda I Thurmond & Judy Stevens to same dated 20 Nov 1843, 149 ac. on Trade River; L:227-8, Thomas M. Catlett to same dated 20 Jan 1844, $6000 for 386 ac. on Livingston Ck.,10 ac. with water grist & saw mill, & 13 ac. ; L:227, John Hallick to same dated 26 Jan 1844, $500 for260 ac. on Lick Ck. ; M:96-8, William Henry & wife Cornelia V. to same dated 7 Apr 1845, $200 for 200 ac. on Cumberland River; M:81-2, Edward N. Owen to same dated 8 Apr 1845, $25 for 35 ac. on Livingston Ck. ; M:212, Lewis Harrell to same dated 19 Sep 1845, $15 for an undivided 5th interest in 100 ac. and 44 ac. ; M:340-2, James T. Moore & wife Sarah C. to same dated 5 Jan 1846, $1500 for 900 ac. on Cumberland River near Eddyville; M:455-6, George G. Cash & wife Margaret E. to same dated 26 Jan 1846, $150 for his interest in 2 tracts on Eddy Ck., one 44 ac. 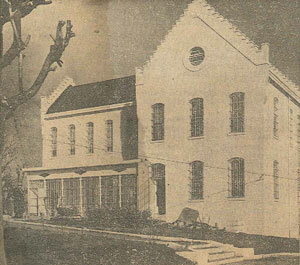 ; M:433, Trustees of Kentucky Baptist Education Society to R. L. Cobb dated 17 Mar 1846, $1200 for all the remaining unsold land donated by State of Kentucky to the Rittenhouse Academy formerly located in this place, 1200 ac. after deducting parcels sold & interference of O'Bannan claim; and N:150-1, James H. Holloway & wife Jinsey to Robert L. Cobb dated 8 Apr 1847, $350 for 125 ac. on Eddy Ck. [S3152] Deeds, Lyon Co., Kentucky, A:24, Laban S. Locker & wife Judith to Robert L. Cobb dated 20 May 1854, $400 for 240 ac., 30 May 1854; A:132-3, Matthew T. Scott and wife Elizabeth F., and Frances Dewees[?] and wife Mary Ann to Robert L Cobb dated 3 Feb 1855, $900 for 750 ac., 7 Mar 1855; and A:304-5, Isaac N. Wilcox to Robert L. Cobb dated 26 Apr 1856, $150 for undivided half of tract of 633 ac., 3 May 1856. [S1975] Deeds, Caldwell Co., Kentucky, G:451, John Hallick to same dated 13 Jan 1835, $1000 for lots #72 & 73 in Eddyville; H:183-3, Thales D. Morrison to same dated 24 Sep 1835, $250 for lot #35 in Eddyville; M:91-2, President & Directors of Cumberland College to same dated 8 Apr 1845, $300 for lot in Eddyville on Water St. near Franklin St., opposite #12; N:375-6, John Long & wife Maria to same dated 15 Apr 1848, $700 for lot in Eddyville, lower side of Water St.; and O:97-8, Alex McCall & wife Rachael M. E. & Thomas Claiborne to same dated 22 Feb 1849, $300 lots #28 & 25 in Eddyville and lot on S. side of Water St.
[S3152] Deeds, Lyon Co., Kentucky, A:35-6, Jessan Olive & wife Barbara Ann to Robert L. Cobb dated 7 Jun 1854, $750 for lot #8, 26 Jun 1854. [S1975] Deeds, Caldwell Co., Kentucky, G:441-2, Thomas Hunter, Deputy Sherriff to Robert L. Cobb dated 9 Jan 1835, $153 for120 ac., in settlement of a Circuit Court order in favor of John Gatewood against William Mosely, former owner, and others; M:128-9, Rezin H. J. Davidge, Commissioner in Chancery to same dated 7 Mar 1843, $1000 for parcel of land in settlement of suit before Caldwell Circuit Court brought by Cobb & Lyon; N:381-2, same to same dated 21 Oct 1847, $50 for 25 ac. to settle suit in Circuit Court to collect mortgage to Cobbs Gray & Bell; O:359-60, David Flournoy, Commissioner of Chancery to same dated 16 Oct 1849, $500 for 97 ac. on Eddy Ck. on both sides of road from Princeton to Eddyville, to settle suit brought in Circuit Court by Robert L. Cobb; P:344-5, W. B. Machen, Commissioner of Chancery, replacing M. Gracey now dec'd to same dated 20 Sep 1851, $480 for interest of John Long in that part of lot in Eddyville not previously sold by Long to Robert L. Cobb & Robt Love, in settlement of suit brought in Circuit Court by H. Machen; P:452, B. J. Grubbs, Deputy Sheriff to same dated 9 Mar 1852, $25 for 100 ac. on Cumberland River, in settlement of writ issued by Caldwell Circuit Court in favor of Cobbs, Gray & Bell; Q:130-1, Frederick H. Skinner, commissioner in chancery to same dated 30 Jul 1852, $75 for lot #36 in Eddyville, in settlement of petition in Christian Circuit Court by Robert L. Cobb; Q:241-3, John H. Rackerby, commissioner in chancery to same dated 11 Feb 1853, $600 for 350 ac. on Cumberland River below & adjoining Eddyville, in settlement of suit brought in Caldwell Circuit Court by R. L. & D. G. Cobb; and Q:384-6, Edward P. Watkins, commissioner in chancery to same dated 11 Jul 1853, $2100 for lot in Eddyville fronting on the river adjacent to ware house formerly occupied by Cobbs, in settlement of suits brought in Caldwell Circuit Court by Planters Bank of Tennessee, Bank of Kentucky, and others. [S3152] Deeds, Lyon Co., Kentucky, A:70-3, Edward P Watkins, Commissioner in Chancery of Caldwell Co. to Robert L. Cobb dated 18 Sep 1854, $100 for 50 ac formerly in Caldwell Co., now in Lyon Co., in settlement of suit by Benjamin H Hesten [?] administrator of estate of Samuel Taylor, against Robert L. Cobb, Gideon D. Cobb, and 10 others, 1 Oct 1854; and A:295-6, Wm. H. Kikgore, Commissioner in Chancery to same, not dated, $529.30 for 225 ac. in settlement of suit by Robt. L. Cobb and Gideon D. Cobb, merchants trading under name of R L & G C Cobb, against administrator and heirs of Wilford Ovey, decd., 18 Apr 1856. [S3152] Deeds, Lyon Co., Kentucky, D:518-9, William B. Emcis [?] agent for John Mathes & wife Sarah, Thomas Gregory Jr., Wisley Gregory, Joseph Steiges & wife Ellen, Joseph Gregory, and William Gregory, heirs at law of Joseph Gregory, decd. to Robert L. Cobb, dated 8 Feb 1872, shows sold by grantor to grantee 10 Dec 1856, 1 Mar 1872. [S838] Kentucky Secretary of State, Land Office, online, describes legislation enabling sale of warrants, and a search of the County Court Order Series for "Cobb" finds 10 grants for Robert, totaling 2987 acres, and 3 for Gideon, totaling 2968 acres. [S839] Kentucky Land Patents, County Court Order Series, Patent No. 1286, (Bk. 4, pg 160), warrant no. 23, dated 18 Apr 1837, surveyed 29 Jun 1837, granted 20 Sep 1839, 200 ac. on the ridge between Lick Creek and Bakers Hollow; No. 5065 (Bk. 11, pg 128), warrant no. 109, dated 1 May 1843, surveyed 8 May 1843, granted 26 Jul 1844, 150 ac. on Clifty Creek; No. 5066 (Bk. 11, pg 129), warrant no. 111, dated 11 Aug 1843, surveyed 15 Aug 1843, granted 26 Jul 1844, 100 ac. on Skinframe Creek; No. 5067 (Bk. 11, pg 130), warrant no. 103, dated 9 Jan 1843, surveyed 19 Jan 1843, granted 26 Jul 1844, 30 ac. on Crab Creek; No. 5363 (Bk. 11, pg 420), warrant no. 112, issued 4 Dec 1844 for his services in repairing the road from Eddyville to Smithland, surveyed 10 Jan 1844, granted 21 Nov 1844, 300 acres on Flat Creek; No. 5364 (Bk. 11, pg 421), warrant no. 112, dated 4 Dec 1843, surveyed 16 Jan 1844, granted 21 Nov 1844, 600 acres on Livingston Creek, a branch of the Cumberland River, the remainder of the grant for repairing the road; No. 6528 (Bk. 14, pg 109), warrant no. 62, dated 3 Nov 1840 (filed with patent no. 7041), surveyed 10 Dec 1840, granted 4 Jul 1845, 500 acres on Long Creek, a part of 800 acres bought by Elias Smith 3 Nov 1840, assigned to Robert 10 Dec 1844; and Patent No. 7717 (Bk. 16, pg 402), warrant no. 75, according to the index but not found, surveyed 21 Jan 1842, granted 3 Jul 1846, 100 acres on Cammack Creek, bought by William M. Etherage, assigned to Robert 18 Jan 1843. [S838] Kentucky Secretary of State, Land Office, online, record for Patent No. 17878, citing Bk. 34, pg 475, shows surveyed 4 Mar 1846, granted 8 Dec 1851, 1000 acres on the Cumberland River, jointly with William Mercer; and No. 21015, citing Bk. 38, pg 379, shows surveyed 2 Jul 1851, granted 1 Apr 1853, 7 acres on Skinframe Creek. [S1975] Deeds, Caldwell Co., Kentucky, I:57, Robert L. Cobb to William O'Hara dated 7 Dec 1837, $300 for lot #35 in Eddyville; K:524-5, same to Ruben R. Bush dated 28 Jun 1842, $1000 for lots #72 & 73 in Eddyville; N:373, Robt. L. Cobb & wife Corenlia B. to Archibald Hunter dated 15 Apr 1848, $350 for lot lower side of Water St. in Eddyville; and Q:46-7, Robert L. Cobb to Jacob Boone dated 12 Jun 1852, $550 for tract in Eddyville with 1 story frame house, on Water St.
[S3152] Deeds, Lyon Co., Kentucky, A:168-9, Robert L. Cobb and Cornelia. Cobb to Morrison D. Wilcox, $350 for lot on south side of Water St., up from Franklin St., dated 20 Apr 1855, 26 Apr 1855; A:396-7, same to Marcus M. Tyler, dated 21 Feb 1857, $1250 for lot # 3, 6 Mar 1857; B:21-2, Robt. L. Cobb and Cornelia B. Cobb to Charles Wood, dated 1 Jan 1859, $150 for lot no 26, 5 Jan 1859; and B:233, Robt. L. Cobb and wife Cornelia B. Cobb to Robert A. Dixon dated 11 Oct 1860, $25 for lot on Spring Alley, 12 Jan 1861. M:381-3, same to John F. Bennett dated 18 Mar 1846, $3500 for386 ac. ; N:288-9, Robert L. Cobb to Robert Love dated 20 Jan 1847, $200 for 200 ac. ; O:61-2, Robt. L. Cobb to William Stubbs dated 12 Apr 1848, $475 for 160 ac. ; O:21-2, Robert L. Cobb to James H. McChesney dated 21 Nov 1848, $400 for 3 tracts, 149 ac., 13 ac. and 20 ac. ; Q:188-9, same to Miriam G. Young, Dicey H. Young, George C. Young, William J. Young, Ceclia Maria Young, Nancy J. Young, & Louisa V. Young dated 17 Jun 1852, $1500 for 200 ac. ; Q:360-1, same to Samuel Garrett & John Garrett dated 2 Mar 1853, $600 for 97 ac. ; and R:281-2, Robert L. Cobb & Cornelia B. Cobb to Needham C. Gray dated 16 Apr 1853, $250 for 125 ac. 162 ac on south side of Cumberland, 2 May 1856; A:304, Robert L. Cobb and William Mercer to Isaac N. Wilcox dated 17 Apr 1856, $300 for 733 ac on south bank of Cumberland River, 2 May 1856; A:397-80, Robert L. Cobb and wife Cornelia B. to James H. Glasgow dated 21 Feb 1857, $1200 for tract of unspecified size, 6 Mar 1857; B:90, Robt. L. Cobb and Cornelia B. Cobb to George M. Coffer, W. H. Coffer, and Henry M. Coffer dated 26 Jan 1859, $500 for 100 ac, 17 Aug 1859; B:189-90, Robert L. Cobb and wife Cornelia B. Cobb to John Stacker dated 9 Jul 1860, $200 for 500 ac, 9 Jul 1860; B:216, same to Georgiann Smith dated 27 Aug 1860, $100 for tract beginning in the edge of the Eddyville and Smithland Rd, 17 Sep 1860; B: 215, same to Henry Hallock, a free man of color dated 6 Sep 1860, $750 for 54 ac adjacent to town of Eddyville, 28 Sep 1860; and B:279-80, same to M. M. Lyon dated 1 Jan 1861, $2,250 for tract on the Eddyville & Smithland Rd, 15 Jun 1861. [S3152] Deeds, Lyon Co., Kentucky, B:377, R. L. Cobb & wife to John W. Ethridge, lot near river, $50, 3 Apr 1863; B:492-3, Robert L. Cobb & wife to Sarah A. Bush, wife of John W. Bush, lot below Eddyville, $50, 10 Oct 1864; B:280-1, Robert L. Cobb & wife to W. E. Lady, $600, at least 200 ac, 15 Jun 1891; B323-4, R. L. Cobb & wife to Benjamin Doom, $750, 326 ac, 8 Jul 1862; B:324-5, Robert L. Cobb & wife to W. W. Hildreth, $1,500, 100 ac, 8 Jul 1862; B:340-1, same to James Lister, $750, 300 ac, 5 Sep 1862; C:28-9, R. L. Cobb & wife to William Moneymaker, $200, 112 ac, 15 Sep 1865; and C410-1, Robert L. Cobb to Joseph Collins, $300, 243 ac, 28 Mar 1868. [S3152] Deeds, Lyon Co., Kentucky, B:482, William Childers & wife to R. L. Cobb, for lots # 41, 42 & 43 in Eddyville, 6 Sep 1864. [S1820] Robert L. Cobb household, 1850 U.S. Census, Caldwell Co., Kentucky, shows occupation as merchant. [S1811] Robert L. Cobb household, 1860 U.S. Census, Lyon Co., Kentucky, shows occupation as merchant. [S3265] R. Cobb, bankruptcy, Schedule A-3, shows debt created in 1859 by R L Cobb & Sons, and that Robert and R L Cobb, L M Cobb, and J C Cobb were doing business as a partnership. [S3266] J. C. Cobb, bankruptcy, Schedule A-3, shows debt created in 22 Aug 1859 by R L, L M, and JC Cobb, firm of R L Cobb & Sons. [S1950] Battle, Perrin and Kniffin, Kentucky - A History of the State, pg 291, shows Joshua's first venture was with his father in Eddyville, where he engaged in the tobacco trade. [S3265] R. Cobb, bankruptcy, Schedule A-3. [S3064] Lawson, Irvin S. Cobb, pg 2. [S3152] Deeds, Lyon Co., Kentucky, C:411-2, Robt. L. Cobb & wife to Sally Marshall, $60, 1-1/8 ac adjoining Eddyville, 28 Mar 1868; C:412-3, same to Henry Hallick & Howard Scott, $100, 2 ac adjoining Eddyville, 28 Mar 1868; C:415-6, same to James OHara of Eddyville, $140, lots # 45 & 46 in Eddyville, 13 Apr 1868; C:507-8, same to Gile Crump, $142.50, 5¼ ac adjoining Eddyville, 7 Dec 1868; C:516-7, Robt L Cobb to H. L. & E. C. Machen, $200, lot in Eddyville below Water St., 14 Dec 1868; C:201-2, Robt L. Cobb & Cornelia B. Cobb to N. T. Braswell, $400, 30 or 40 ac, 6 Nov 1866; C:244, Robert L Cobb & wife to F H Wilson, $300, tract size unspecified, 5 Feb 1867; E:217-8, Robt. L. Cobb & wife to James Peacher, $600, 40 ac, 17 Apr 1874; D:224, same to Carter Blue, $250, 20 ac, 29 Aug 1870; C:385, R. L. Cobb to Russell W. Wake, $250, 100 ac, 8 Feb 1868; and D:111-2, Robt. L. Cobb & wife to William Cash Jr., $125, 2½ ac, 1 Jan 1870. [S3152] Deeds, Lyon Co., Kentucky, C:245, George McHuggans & wife Sarah Ann to Robt. L. Cobb, 25 Mar 1867; and C:250-1, Robt. L. Cobb & wife to Charles Anderson, 26 Mar 1867. [S3152] Deeds, Lyon Co., Kentucky, B:556-7, Robt. L. Cobb & Gideon D. Cobb to Jacob T. Young, $1,000 paid by two notes $500 each, 24 May 1865; C:54-6, John W. Clark commissioner in chancery to R. L. Cobb, in accordance with decree Jun 1865 term in Lyon Circuit Court in suit, R. L. & G. D. Cobb planitiffs, W. H. Long & John Boyd adminstrators of Jacob T. Young, decd, & Mary Ann Young, Mildred B. Young, & Sarah L. Young defendants, 1 Jan 1866; and C:140, Robt. L. Cobb & wife to Darwin Rogers, 6 Apr 1866. [S3266] J. C. Cobb, bankruptcy, petition; Schedule A-3, unsecured debts. [S3266] J. C. Cobb, bankruptcy, petition; Schedule B, assets. [S3152] Deeds, Lyon Co., Kentucky, D:40-3, John Boyd, late sheriff Lyon Co. to Joshua C. Cobb, 26 Jul 1869; and D:96-8, Joshua C. Cobb and Willis B. Machen to Frederick H. Skinner, shows Machen had sold to Joshua C Cobb for $3600 on 23 Jul 1869 and directed sheriff to make the deed to Cobb, 18 Nov 1869. [S3152] Deeds, Lyon Co., Kentucky, D:96-8, Joshua C. Cobb and Willis B. Machen to Frederick H. Skinner, 18 Nov 1869. [S1977] Cobb, Exit Laughing, pg 24. [S3152] Deeds, Lyon Co., Kentucky, D:96-8, Joshua C. Cobb of Paducah and Willis B. Machen to Frederick H. Skinner, 18 Nov 1869. [S3152] Deeds, Lyon Co., Kentucky, D:134-5, John Boyd, former sheriff Lyon Co. to W. B. Machen, for lots no. 16 nd 17 in Eddyville were Thomas P. Paine lived, a vacant lot back of the drug store of Bowman & Smith, and 2 ac on bank of Cumberland River, all owned by Paine, 26 Feb 1870. [S3152] Deeds, Lyon Co., Kentucky, C:384-5, Robert L. Cobb to William W. Young, 8 Feb 1868. [S1042] Connelley and Coulter, History of Kentucky, pg 497, shows year, as 1870. [S628] Robert L. Cobb household, 1870 U.S. Census, McCracken Co., Kentucky, shows occupation as retired merchant. [S628] Robert L. Cobb household, 1870 U.S. Census, McCracken Co., Kentucky. [S3376] "Commander of the Famous Cobb's Battery", pg 309. [S1820] Robert L. Cobb household, 1850 U.S. Census, Caldwell Co., Kentucky, shows them in same household, appearing to be parent and child. [S1811] Robert L. Cobb household, 1860 U.S. Census, Lyon Co., Kentucky, shows them in same household, appearing to be parent and child. [S2743] "Death Claimed Capt. Linah Cobb," The Paducah Sun, 21 Apr 1904. [S1950] Battle, Perrin and Kniffin, Kentucky - A History of the State, pg 291. [S2087] Henry Cobb grave marker, Eddyville Cemetery, shows son of R. L. & C. B. Cobb. [S2086] Sarah T. Cobb grave marker, Eddyville Cemetery, shows daughter of R. L. & C. B. Cobb. [S2085] Gideon D. Cobb grave marker, Eddyville Cemetery, shows son of R. L. & C. B. Cobb. [S3409] Mrs. Bobbie Cobb James, Certificate of Death. [S3107] "The Grim Reaper," The Paducah Sun, 20 Nov 1905. [S628] Robert L. Cobb household, 1870 U.S. Census, McCracken Co., Kentucky, shows him in the household of Robert L. and Cornelia, apparently as their son. [S3235] Obituary for Mrs. Cornelia B. Cobb, unknown newspaper, 2 Jun 1875, shows she had twelve children, five then living, listed as Robert, Linah, Joshua, Mark, and the widow of John B. Saunders. We encourage you to use the "Contact Us" link below if you are interested in the people shown on this page or to inquire about people in related lines not included. Basic information on many more people we are in the process of researching can be found in our Outline Section. Please see the Main Page for details.